The Sparkill Dominican Associates in New York provided an ice cream social for the Sisters to celebrate the end of their monthlong project to collect pajamas and books for children who go to bed each night having to wear the clothing they wore all day because they are either living in shelters or their families lack the resources to provide them with sleepwear. Having collected 730 pairs of pajamas and accompanying books, the Associates and Sisters wrapped each pair of pajamas, along with an age-appropriate book for bedtime reading, which will be donated to children in area shelters in collaboration with Pajama Game. 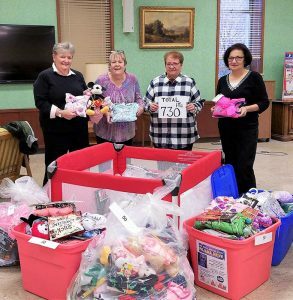 The Sparkill Dominican Associates in St. Louis spearheaded a drive to provide gift bags of needed items for new mothers who do not have many resources to care for their newborns. A “Sweet Babies” gift bag stuffed with love, sleepers, onesies, outfits, hats and socks, something warm for winter, diapers, wipes, receiving blankets, books, bibs, baby blankets or quilts is given to each new mother who needs assistance. The Associates set aside the month of October to collect what they could for this program and were delighted with the result: “Sweet Babies” will receive a very full car trunk which will help them during the year.